Join us for an unforgettable 10-days of guided trekking through the virgin paradise of Northern Patagonia. Along the way you’ll become intimately acquainted with this region of the Andes, which has only just recently gained the touristic appreciation it deserves. We will enjoy contact with a rich local culture, hiking through pristine temperate rainforests, and marvel at towering granite peaks reminiscent of those of Yosemite. We spend our time in the superlative Cochamó and Puelo River Valleys, using a diverse set of trails including ancient trade routes as well as tracks created in just the past few years in the building of the new park, Tagua Tagua. Our small group will head way off the beaten path through the untamed regions of Chile and do so in style as our daily efforts are rewarded with incredible scenery, fascinating people, cozy accommodation, tasty local cuisine, and delectable Chilean wines. Simply put, you’ve got to see this place! 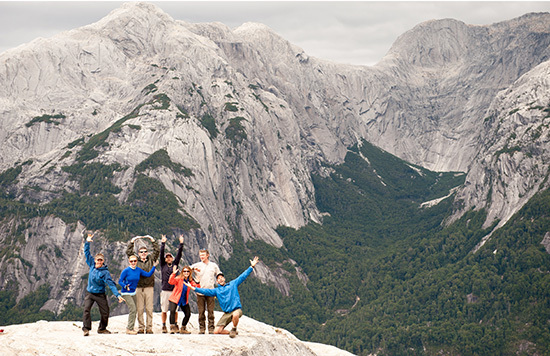 Collectively the SYMG guides and staff have years of experience trekking and traveling throughout Patagonia. National Geographic has named us “Best Outfitter on Earth” and we’re renowned for our unique itineraries, exceptional guides, small groups, and attention to detail. We also work closely with local staff in an effort to support the local economy and to make sure that you get the most out of your trip from start to finish. With SYMG, every Chile trip is the trip of a lifetime and this small-group departure to Patagonia’s most unique and undiscovered regions is one of our best! To learn more about our travel philosophy and style, click here. Includes friendly bilingual guide, with a passion for native flora & fauna, and local history & culture. All SYMG guides are professionally trained, hold advanced medical certifications and carry VHF handheld radios in case of emergency. Gratuities are accepted and appreciated for a job well done. Moderate-Difficult (Difficult if partaking in all hiking activities, notably within Cochamo, otherwise moderate). This trip is pack horse/porter assisted which means one can expect to hike with a day pack weighing at most 15 pounds (7 kilos) for a maximum of 8.5 miles (14 km) per day over rugged trails with some steep ups and downs. We will spend the first night of the trip in a quaint B&B in Puerto Varas, Chile. Night two we will spend in the remote but luxurious Petrohue Lodge near the Osorno Volcano. The next two nights are spent off the grid in the quaint Mountain Lodge of La Junta, Cochamó. Nights five and six we spend at the Campo Eggers Bed & Breakfast in Llanada Grande. Then we will enjoy two nights of off the grid ‘‘glamping’’ inside the cozy refugios of Parque Tagua Tagua. The final night of this trip is again spent at a B&B in the town of Puerto Varas. We supply all group gear (water filters, group first aid kit, etc.). Sleeping bags are only needed for the two nights in Parque Tagua Tagua. Participants may choose to supply their own sleeping bag (20F or warmer), but don't need to. Participants will bring their own clothing and footwear. A detailed gear list will be sent to you upon registration. All meals included as indicated in the program below. We can adapt the menu based on medical needs. (9 breakfasts, 8 lunches, 8 dinners and trail snacks). We take pride in providing excellent meals even in remote surroundings. All transportation is included from airport on day 1 to airport on day 10. That includes round trip van transport to/From Puerto Montt Airport (PMC), van transfer from Puerto Varas to our wilderness playground, round trip ferry to cross Lago Tagua Tagua, van transfer to and from Llanada Grande, small craft ferries on Lago Azul and Lago Las Rocas, van transfer to Cochamó. Meals (as noted above), group camping gear (as noted above), personal camping equipment (as listed above), accommodations (as noted above), mule and porter support, transportation (as noted above), applicable permits, professional mountain guide(s), all incidental gratuities for local staff (this does not include your trip leader), pre-trip planning packet, and trip support from our friendly office staff. Round-trip Airfare to Puerto Montt, Chile, Personal clothing and footwear, personal gear not listed under “Equipment” above, tips for main guide/trip leader (10-15% of trip cost is customary), alcohol on Night 1 dinner, Dinner on Day 9, and optional (and highly recommended) trip insurance. Training is paramount to the enjoyment and success of your trip. We recommend exercising in the months prior to your trip to bolster sustained cardiovascular/aerobic activities as well as core and leg strength. Day hikes with a full backpack, preferably on hilly, off road terrain, is the best way to train for our trips. Activities such as cycling and step-master type machines are also excellent and preferable to a routine comprised solely of running. Prices based on shared occupancy. Fabulous, fabulous, fabulous! Maybe the best vacation ever! If there was a category beyond excellent I would use the to describe our guide. From the moment we met at the airport until our final departure he was 100% engaged with us. His love of Chile, the people and the land came through in all of our activities. From hiking through Tagua Tagua, identifying flora & fauna, identifying native birds and discussing the history of Chile (both environmental and cultural). His interaction with all of our hosts, drivers and those we met on the trail was always carried out in a very kind, joyful and expert manner. Jason's attention to detail was amazing. There were a lot of connections to make, with our combination of hiking, boating and van rides, which were all carried out in a seamless fashion. His meal planning was great, always had plenty of food. Many delicious dinners in the Refugios (one even including salmon). He far exceeded our expectations as a guide. He felt like a good friend by the end of the trip and his love of the Chilean forest and mountains will always be with us. Jason was amazing!! We couldn't have asked for a better guide. He was friendly, kind, amazing with the children (and us parents), sweet, honest, trusting, forthcoming, flexible, and always had plan B in the back of his mind. We always felt comfortable, safe, taken care of, and happy. He went above and beyond and helped our children with their homework, and also taught them valuable lessons through amazing stories. We are so fortunate to now call him our friend. We had an amazing time on the trip, and it was such a wonderful bonding and learning experience for our family. We are so grateful to SYMG and Jason for agreeing to take our children - we have a hard time finding companies that allow children, even on private trips. (Despite ours hiking as well as many adults!) Our travel with Jason was very smooth, and we enjoyed some excellent meals and lodging. "Hidden" (Northern) Patagonia is a very special place, and we loved exploring it. SYMG and their in-country guides know the pristine valleys, the random hidden trails, and the local treasures, including the gracious and happy people, that make Patagonia come alive. Whether you explore the temperate rainforest of northern Patagonia, or the awe-inspiring mountains, rivers, and glaciers of Torres del Paine in the south, or both, as we did, SYMG provides a wonderful mix of hiking exercise, unforgettable experiences, and full adventure. Patagonia is an amazingly awesome place to visit. Nowhere is the land, the culture and the accessibility still so capable of evoking a 19th century experience as the upper reaches of the northern Lake District. But if adventure of this sort is what you want, guides are a must. The logistics are daunting, access permission is required (many of the special places are on private lands), and the range of vehicles required is diverse (boats, trucks, cars and mules). And thus, retaining an experienced guide is a must. I can't think of a service more experienced and capable than SYMG. Unless you want the brain damage of OJT, then seek out SYMG and have the time of your life! These guys really know how to do this. Oh, and one more thing. You're going this far for adventure? Then, GO TO TORRES DEL PAINE IN THE SOUTH! As unique a mountain range as exists on the planet! Just Do It!